TDMA is the access method used by the Electronics Industry Alliance and the Telecommunications Industry Association for Interim Standard 54 (IS-54) and Interim Standard 136 (IS-136). 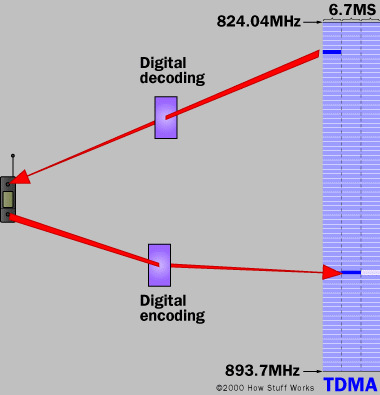 Using TDMA, a narrow band that is 30 kHz wide and 6.7 milliseconds long is split time-wise into three time slots. Narrow band means "channels" in the traditional sense. Each conversation gets the radio for one-third of the time. This is possible because voice data that has been converted to digital information is compressed so that it takes up significantly less transmission space. Therefore, TDMA has three times the capacity of an analog system using the same number of channels. TDMA systems operate in either the 800-MHz (IS-54) or 1900-MHz (IS-136) frequency bands. TDMA splits a frequency into time slots. emitted by your cell phone. Click the picture above for more information on how to protect your cell phone now. Try any Q-Link or cell chip for 3 months, absolutely RISK-FREE If you do not feel Q-Link improves your focus, energy, or well-being, simply return it for a full refund. Airtube headsets have 30 day refund.